One of the joys of finishing a season of sport is that, if the team is well managed, there is generally money in the kitty for a post season breakup dinner and beers. The other joy is that the team can take advantage of all those ‘Parma & a pot’ style deals Melbourne pubs offer on weeknights. While legitimately dressed in basketball singlets. After our nailbiting mixed basketball loss (by 5 points!) to finish the season, one recent Wednesday night, we took advantage of the Clarendon’s $14 “burgers or fish ‘n’ chips” night to use up our kitty money and check the place out. 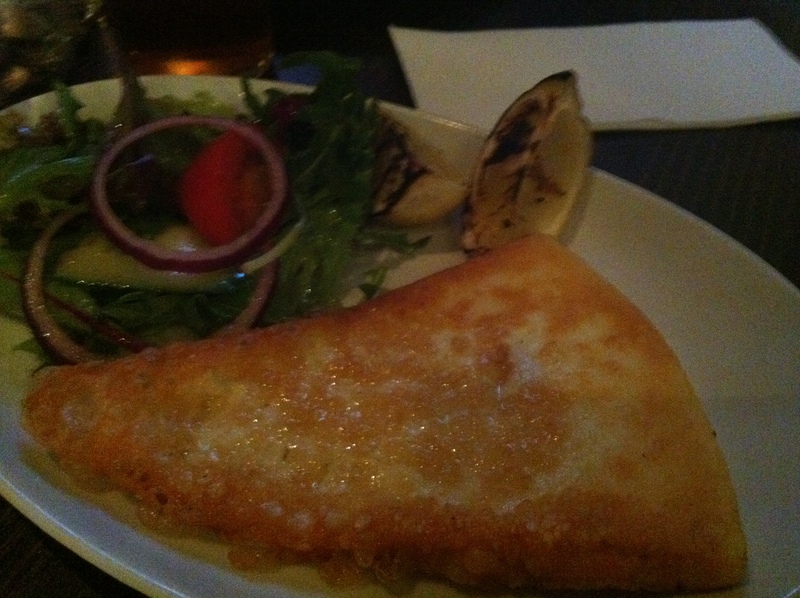 We had a vegetarian in our midst, so he plumped for the vegie burger AND a side order of saganaki (hungry boy). 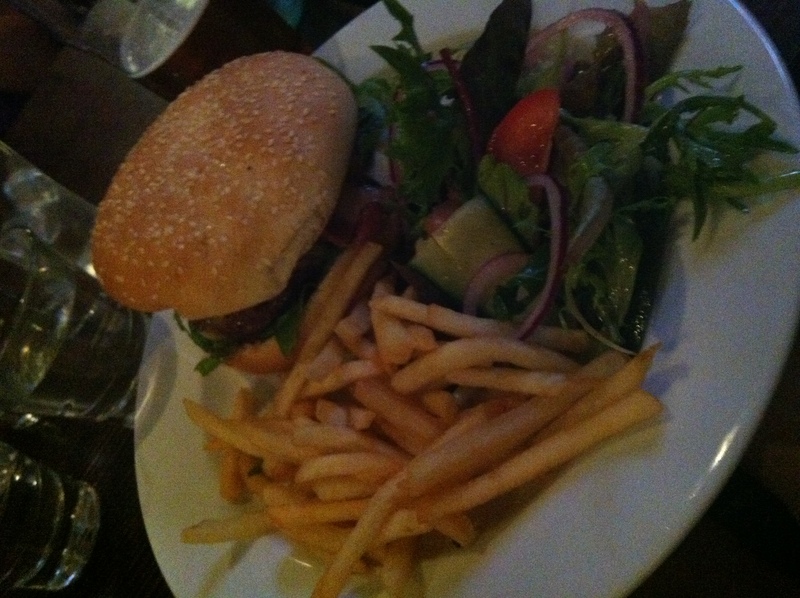 The rest of us pretty much uniformly chose the burger, given that Good Friday fish and chips dinner was a relatively recent memory. I know, I’m well behind with this post, eh! Nothing like a slab of grilled cheese after a game of basketball. The Clarendon burger is an unashamed traditionalist. The burger bun is of the soft and large sesame seeded supermarket type, and the chips on the side are french fries. 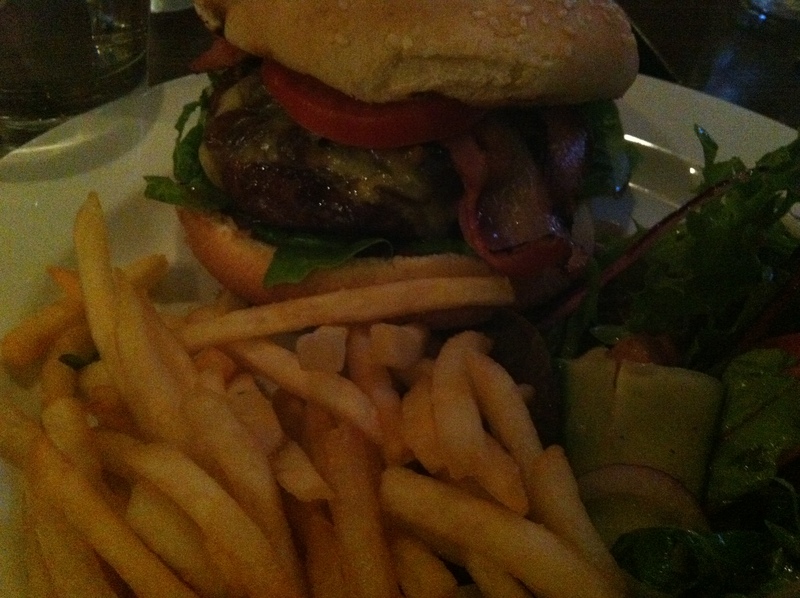 Inside, there’s bacon, caramelised onions (green tick of approval) and a thick meat patty. The burger had lashings of mayo which divided the table. Some liked it (guilty!) and others were a little sickened by it. It’s a fine line with a burger bun. While the soft number provided here is the traditional way to go, the bread doesn’t provide enough structural integrity to hold any more contents than those of a Maccas bun. I’m not a fan of trying to catch all the sloppy contents of my burger in my hands and chom it up in a disgraceful manner. But neither do you want to be gnawing on a rock hard ciabatta with a burger. Around the table, though, more were in favour of swapping the bun out for something better able to handle the might of the contents. A view of the contents. The Clarendon’s got a nice spruced up atmosphere and staff were patient with taking our orders. On the whole, you could do a lot worse than rocking up for a $12 burger on a Wednesday night, but the burger didn’t wow us. I’m surprised at the low rating it has on Urbanspoon, but then again I wasn’t expecting a lot. Tags: basketball, burgers, food, review, saganaki. Bookmark the permalink.